Victor Adeboyejo remains on Kenny Jackett’s radar – but Pompey are yet to offer the free agent a contract. 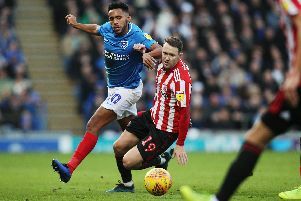 The former Leyton Orient forward trained with the Blues last week and has been in talks over a potential move to Fratton Park. At present, Adeboyejo is on trial at Chelsea and has played two matches for their under-23s side – against Swansea City and West Ham respectively. Meanwhile, the Nigerian is also attracting interest from Championship outfits Bolton Wanderers and Barnsley. Jackett is still casting his eye over Adeboyejo and has assessed the 19-year-old’s performances for the Stamford Bridge outfit. But the Pompey manager stressed a deal has yet to be tabled. ‘We’ve watched the games he’s played in,’ said Jackett. ‘He’s had two games now and came off after 65 minutes on Sunday against West Ham. ‘However, we have not moved or made an offer from him. ‘Is he someone that we’re aware of? Yes. Jackett has been running the rule over several triallists in recent weeks. Bruno Andrade trained with the Blues earlier this month. The Boreham Wood striker has been in rampant form this season and is the National League’s top scorer with nine goals to date. He was in the Westleigh Park stands to watch the reserves’ recent 2-1 defeat against Everton under-23s. Pompey have also looked at free agents Thomas Juel-Neilsen and Ceykan Karagozlu. However, Jackett ended his interest in both after they featured in trials games for the reserves against Everton and Bristol City respectively.